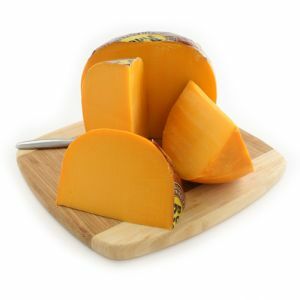 Mimolette is a cheese traditionally produced around the city of Lille, France. In France, it is also known as Boule de Lille after its city of origin, or vieux Hollande for being made after the tradition of Edam cheese from the Dutch province of North-Holland. In some areas of Belgium and the Netherlands, such as Flanders, it is also known as commissiekaas. It was originally made by the request of Louis XIV, who - in the context of Jean-Baptiste Colbert's mercantilistic policies - was looking for a native French product to replace the then very popular Edam. To differentiate it from Edam, however, he had it coloured orange. A cow's-milk cheese, it normally weighs about 2 kg. Its name comes from the French word molle, meaning "soft". This refers to the softness of the crust when young - with age it becomes harder. It has a grey crust and orangish flesh. The orange colour comes from the natural colorant, annatto. The cheese has a similar appearance to a cantaloupe melon. The greyish crust of aged Mimolette is the result of cheese mites intentionally introduced to add flavor by their action on the surface of the cheese. Mimolette can be consumed at different stages of aging. When younger, its taste resembles that of Parmesan. Many appreciate it most when "extra-old" (extra-vieille). At that point, it can become rather hard to chew, and the flesh takes a hazelnut-like flavour.